After reading your review, I promptly requested this book from my library! 😀 So happy my library actually has it. I can’t wait to read it! Sounds like a fantastic read, a fun twist on the tales. I haven’t read it yet, mostly because at the point where I heard about it, I was ridiculously busy. And then I sort of forgot about it. I will make sure to read it soon, though. WHY do I not have this book??? It sounds, well, perfect! I totally know what you mean about it having that beautiful but hilarious fairytale feel. That is the BEST kind. I don’t know how fairytale books like this manage it. Both so funny and yet gorgeously written. Just yes! I need this!! So many books, so little tiiiime. D: And money. I need to peruse my library for things, methinks. I love this book so much!!! I’m convinced and have added it to my TBR. I’ve seen this book around, but your review is the first to make me wish I had it! Normally I’m a harmless sort of stalker, and I don’t comment much, if any, but this time I had to. 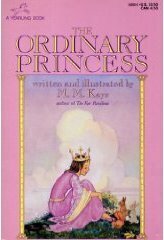 The Ordinary Princess! It really is a perfect fairytale. I’ve had it forever, and read it more times than I can count. My sister and I read it aloud by turns in the wintertime. Peregrine is. . . well. . . Peregrine. I think he’s been one of my favourite characters since the first time I read it. And the book itself is so very quotable. My sister and I are always swapping quotes. I have so many I can’t even think of one to put here. . . basically the entire book. And that part where he’s talking about how he hardly ever gets a day off ;).